An in-development version of the hardware. To address this issue, [Alireza Safdari] has spent the last several years working on a truly open source RC transmitter that can be modified and augmented to meet the user’s needs, called the Alpha V1. With the hardware and software nearing completion, he’s looking to get some community feedback on the system before the planned crowdfunding campaign kicks off. From his personal experience, [Alireza] found that traditional RC transmitters have their limits when you start using them for robotics. You’ll often want input schemes or devices which would never occur to the remote’s designers, and you’ll almost certainly want to have more channels and functions than the original hardware will allow. 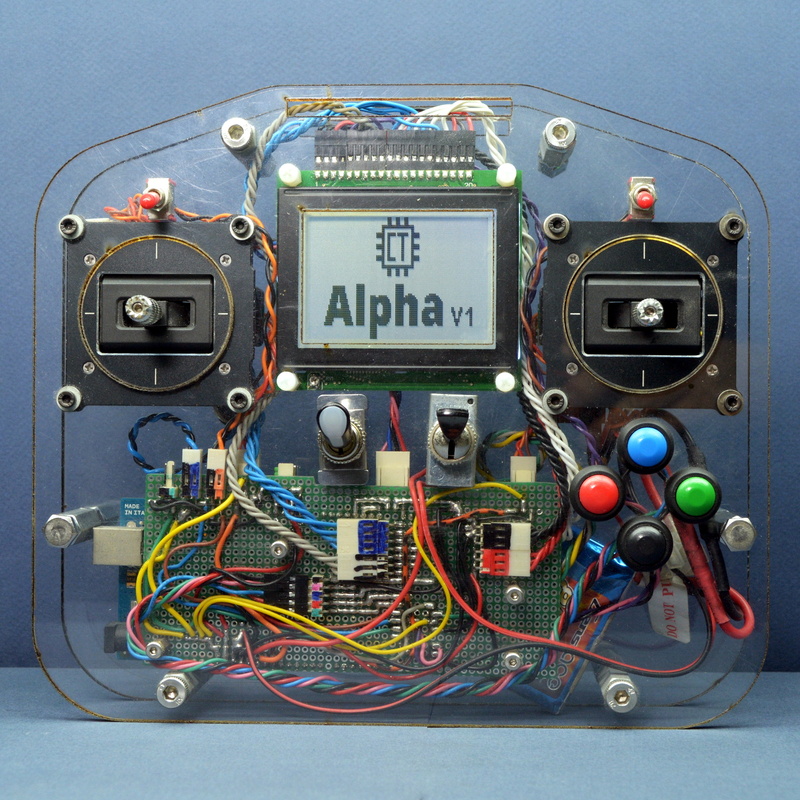 One of the big advantages with the Alpha V1 is that the front and back of the controller are simple acrylic panels, meaning you can easily cut openings or drill holes in them to add more hardware without having to deal with the (relatively) ergonomic shapes of a traditional transmitter. Of course, that’s only one half of the equation. When you add new hardware, you’ll need to make the software aware of it. To that end, [Alireza] says he and his team have developed a library of adaptable firmware modules which should make it very easy to add in new components without having to get bogged down with software configuration. In fact, he says the goal is to allow the user to add new hardware to the Alpha V1 without requiring them to write a single line of code. The Alpha V1 communicates at 2.4 GHz using either XBee or Murata DNT24 radios, and supports as many as 72 individual channels as well as two-way telemetry. If your requirements aren’t quite so high, we recently covered a significantly less intimidating attempt at building an open source RC transmitter that might suit your needs. If adding a cell modem is dealing with a drama queen of a hardware component, then choosing from among the many types of modules available turns the designer into an electronics Goldilocks. There are endless options for packaging and features all designed to make your life easier (or not!) so you-the-designer needs to have a clear understanding of the forces at work to come to a reasonable decision. How else will Widget D’lux® finally ship? You are still working on Widget D’lux®, aren’t you? So you went to a tradeshow and heard about this cool new idea called the Internet Of Things; now it’s time to build an IoT product of your own. You know that to be IoT, your Widget D’lux® has to have a network connection but which to choose? You could use WiFi or Bluetooth but that would be gauche. Maybe LoRaWAN? All the cool kids are using LoRa for medium or long range wireless these days, but that still requires a base station and Widget D’lux® will be a worldwide phenomenon. Or at least a phenomenon past your bedroom walls. And you know how much user’s hate setting things up. So a cell modem it is! But what do you have to do to legally include one in your product? Well that’s a little complicated. The GePS is a musical project that shows how important integration work is when it comes to gesture controls. Creators [Cedric Spindler] and [Frederic Robinson] demonstrate how the output of a hand-mounted IMU (Inertial Measurement Unit) and magnetometer can be used to turn motion, gestures, and quick snap movements into musical output. The GePS is designed to have enough repeatability and low enough latency that feedback is practically immediate. As a result, it can be used and played like any other musical instrument that creates sound from physical movements in a predictable way. It’s not unlike a Theremin in that way, but much more configurable. To do this, [Cedric] and [Frederic] made GePS from a CurieNano board (based on Intel’s Curie, which also has the IMU on-board) and an XBee radio for a wireless connection to software running on a computer, from which the sounds are played. The device’s sensitivity and low lag means that even small movements can be reliably captured, meaning that the kind of fluid and complex movements that hands do every day can be used as the basis for playing sounds with immediate feedback. In a very real sense, the glove-based GePS is an experimental kind of new instrument, which makes it a fascinating contender for the Musical Instrument Challenge portion of the 2018 Hackaday Prize. Why Have Only One Radio, When You Can Have Two? There are a multitude of radio shields for the Arduino and similar platforms, but they so often only support one protocol, manufacturer, or frequency band. [Jan Gromeš] was vexed by this in a project he saw, so decided to create a shield capable of supporting multiple different types. And because more is so often better, he also gave it space for not one, but two different radio modules. He calls the resulting Swiss Army Knife of Arduino radio shields the Kite, and he’s shared everything needed for one on a hackaday.io page and a GitHub repository. Supported so far are ESP8266 modules, HC-05 Bluetooth modules, RFM69 FSK/OOK modules, SX127x series LoRa modules including SX1272, SX1276 and SX1278, XBee modules (S2B), and he claims that more are in development. Since some of those operate in very similar frequency bands it would be interesting to note whether any adverse effects come from their use in close proximity. We suspect there won’t be because the protocols involved are designed to be resilient, but there is nothing like a real-world example to prove it. This project is unique, so we’re struggling to find previous Hackaday features of analogous ones. We have however looked at an overview of choosing the right wireless tech.